The benefits of skiing at Easter are easy to spot: the weather is usually warmer, the sun brighter, days longer, and there is never a shortage of excellent Easter-themed treats on offer. 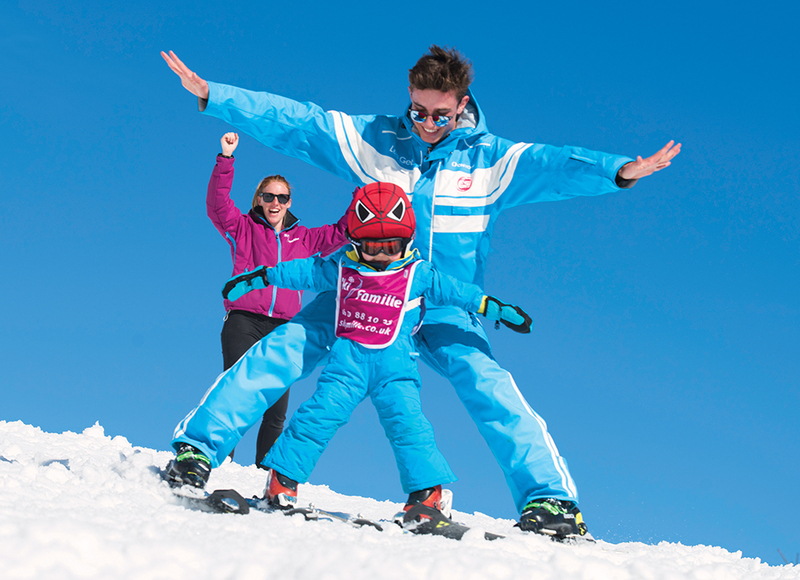 But there’s more to a great Easter ski holiday than the dates; picking the right resort for you and your family is key. What Makes a Good Family Resort for Easter Skiing? No resort is going to be ‘bad.’ Mix skiing and time off and family bonding and you’re going to have an excellent time. But to really get the best value out of your time away, consider these important factors. The best setting and facilities for family holidaying is a chalet. They are catered on 6 days a week (7 for children), so you don’t need to worry about shopping, cooking, or even cleaning up. Families tend to love the concept of family suites (a bedroom for adults, bedroom for children and a bathroom all behind one door). Away from the family suites, you share the beautiful common areas with another family or two who are also there to ski. Or if your group is big enough, you can enjoy the whole chalet to yourselves! You’ll find cosy amenities in our properties such as deck chairs on the chalet’s sunny terraces, outdoor hot tubs and indoor fireplaces. All our chalets provide in-chalet childcare too, meaning you don’t have to hustle your tiny ones off to an outside facility. That’s more comfortable for them, and better for you too. The chalet should be close to the ski lifts too; you should be able to walk it in five minutes or less, or better yet, ski right to and from your front door (as is the case for some of our chalets such as Aigle, Faucon and Delphine). Having great snow conditions late in the season usually comes down to two things: Altitude and Latitude. There are exceptions, where slopes are shielded from the sun for more of the day, or where microclimates allow the snow to linger on a little longer than normal, but for the most part, resorts that are higher above sea level, or further north, will keep their good snow conditions longer. For you, that means better skiing. Which difficulty level(s) you need for your family depends on how skilled and experienced each member is. If you’re all the same level – whether that means beginners or experts – then you’ll want a ski area with lots of variety at that level. If skill levels and tastes within your family vary, as they most often do, you’ll want an area with a wide variety of runs for each of you. We look for two factors. First, are there runs for each skill level in the family? Second, is there a reasonable variety within each difficulty level? Few people are satisfied going up and down the same few runs for days at a time; your ideal resort should have lots to explore and experience. Even for people who are fairly confident on skis (or boards), a good ski instructor can take your abilities to the next level. That means more control, more safety, and more fun. The ski school should be taught by an expert skier with experience in teaching. The classes should also be in English. We’ve chosen to use 360 International in Les Gets, and Ecole du Ski Francais (ESF) in La Plagne, Les Bruyeres (3 Valleys) and Reberty 2000 (3 Valleys) for their professionalism and ability to teach children in a fun and encouraging environment, as well as the continued good feedback we receive from children and parents alike. If you have young children who will be taking some lessons, it’s convenient and saves both time and energy by choosing a chalet right next to the learning area. All our chalets meet this criteria, with our Reberty 2000 properties (Katie 1, Katie 2 and Eva) being just a stone’s throw (or snow throw) away from ski school. Boarding lessons are also available from most ski schools. You won’t be on the slopes every moment of the day. A little time off-piste will even enhance you and your children’s enjoyment of those hours you do spend on skis… So a suitable resort will also have a lot of other fun activities. These activities come in all shapes and sizes. There are activities that are similar to skiing, like tobogganing or sledging, snow machine rentals, snowshoeing, cross-country skiing, and other activities on the snow. 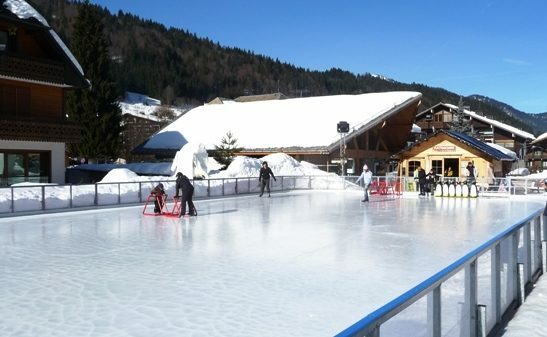 There are more restful activities, like watching films at the Les Gets cinema, ice skating, lounging in cafés, restaurants or games rooms. Other options include laser tag in La Plagne centre, indoor play areas, and more. 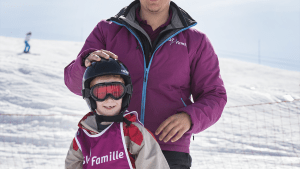 Whatever your family likes to do – or wants to try – it might make a nice addition to your ski holiday, and can give you the time out you need to get back on the slopes with renewed energy and excitement. We do have a top choice for family skiing at Easter, but it’s far from the only good option, so before we reveal the number one spot, here are a couple of others that deserve an honourable mention as great spots for a family ski holiday. We’ll call them the runners-up. 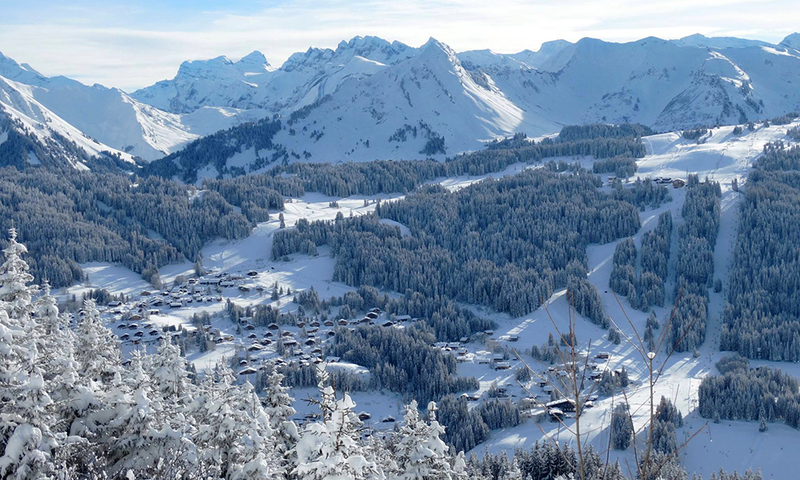 Just an hour and 20 minutes from Geneva with our inclusive transfers, Les Gets is a charming resort nestled among the trees on the shoulders of the mountain. With access to over six hundred kilometres of skiing and two hundred lifts, it offers something for a wide range of preferences and abilities. Our chalets in Les Gets offer everything your family needs for an immersive, alpine ski holiday. The same great alpine décor and very modern features are available, along with amenities that include perks like roof-top saunas and hot tubs in Chalet Petit Moulfon and Grand Mouflon, rooms with heated ski-boot warmers (in all our chalets) to keep your equipment safe and ready for comfortable use when next in need, and shuttle buses to and from ski school locations. Even if your list of wants is a long one, we probably have a chalet in Les Gets that fills it – and more. Our friendly and knowledgeable team can guide you on which chalet is most suitable on 01252 365 495. Though only 11% of the runs are rated green, that still works out to substantial skiing choice when one considers the overall size of the skiing area on offer. A whopping 43% are blue, which means a confident beginner will have a good choice of increasingly-challenging runs making up more than half of all those available. 35% of the runs are red, best for those with considerable experience and a desire to push themselves, and the remaining 11% are rated black, best for the expert who craves the steep and deep thrill of a technically-demanding run. We have built a close relationship with 360 International Ski School and our guests have commented on their friendliness, English proficiency, and ability to teach a variety of ages and levels in a fun, knowledgeable manner. They are based right by the slopes and our chalets too. The thrills aren’t only found on the ski runs, as visitors can try dog-sledding, ice skating, hot air ballooning, and even paragliding! For something a bit more low-key, take a stroll through the beautiful little village, pick up some fresh food at the weekly Thursday market, or check out the wide range of shops and boutiques. Most of the restaurants in the area cater to those wanting traditional Savoyard (alpine) food – like Le Vaffieu and Le Tyrol, but there are at least a few options for those wanting fast food, pizza, or fine dining at the other end of the culinary spectrum. Nightlife isn’t the main reason families choose Les Gets, but there are plenty of relaxed bars for a drink or two. Bar Bush is a popular choice, or for the small minority looking for more of an electric atmosphere, Igloo Nightclub offers just that. La Plagne is a good-looking, alpine-styled resort, but what elevates it into the ‘stunning’ category is the view. From the chalets and lifts, the eye can wander over panoramic views of neighbouring valleys and peaks – the effect is almost breath-taking. Plagne Centre is a cluster of buildings and facilities, resting on the shoulder of the mountain with runs stretching above, below and around it. 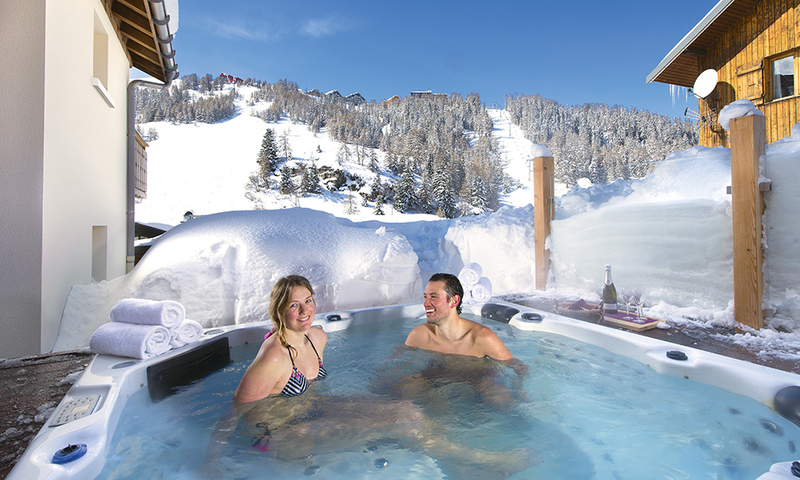 Other hubs, such as Plagne 1800 (where you’ll find our chalets Nicole and Delphine) are placed around it on the mountainside and feature lifts that connect your temporary residence with the hub of activity at Plagne Centre. The design and décor available is of high-quality, but invites a laid back kind of relaxation – furnishings are often more ‘rustic-chic’ than formal. The result is stylish comfort is a relaxing atmosphere. We love Plagne 1800 for its superb location while offering an inviting, pretty and peaceful alternative to the purpose-built Plagne Centre. 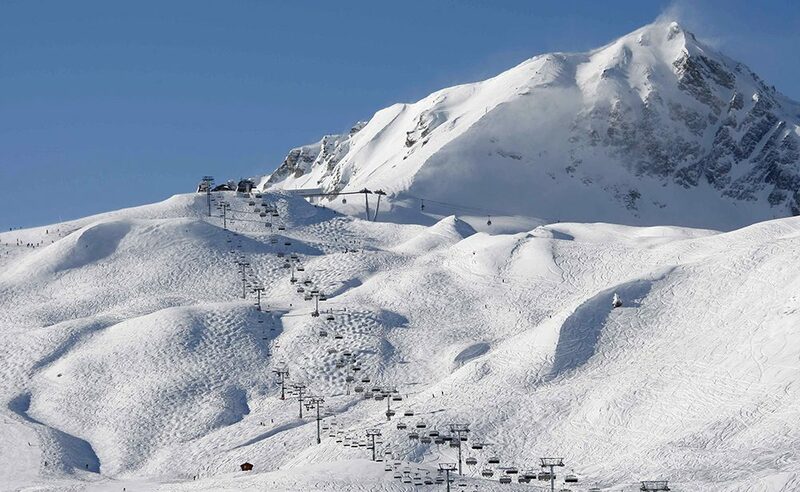 La Plagne is at altitude and this is reflected in its long-running season, which stretches to the end of April. This means that you are more likely to have good snow conditions over Easter, even if the weather is mild. La Plagne is a sizeable network of runs, with 425 kilometres of pistes to explore. That size means that the relatively low percentage of Green-rated runs (8%) still gives most beginners more than enough room to explore runs appropriate to a lower skill level. There are also designated children’s zones, so your little ones won’t have to worry about adults trying to navigate around them while they learn to ski and practice skills – they can concentrate on the fun of it all instead. Where La Plagne really shines, is in the provision of intermediate runs. 51% of pistes are rated Blue. There are even Blue runs that start up near the peaks and give intermediate skiers the full, panoramic experience of alpine skiing – without demanding expert levels of skill or daring. Some follow the high ridges before winding their way down into the valley toward the central hub and chalets, allowing skiers a long, uninterrupted run that can stretch from high on the peak to the valley floor and your waiting accommodations. There are an additional 26% in Red runs for the intermediate skier who is more daring or ready to take the next step upward. The remaining 15% is made up of Black-rated runs of course, and there is no shortage of thrilling terrain for any expert skiers in your family. The children’s ski school area is in easy walking distance of our chalets, and instruction is available (for all ages) in English. 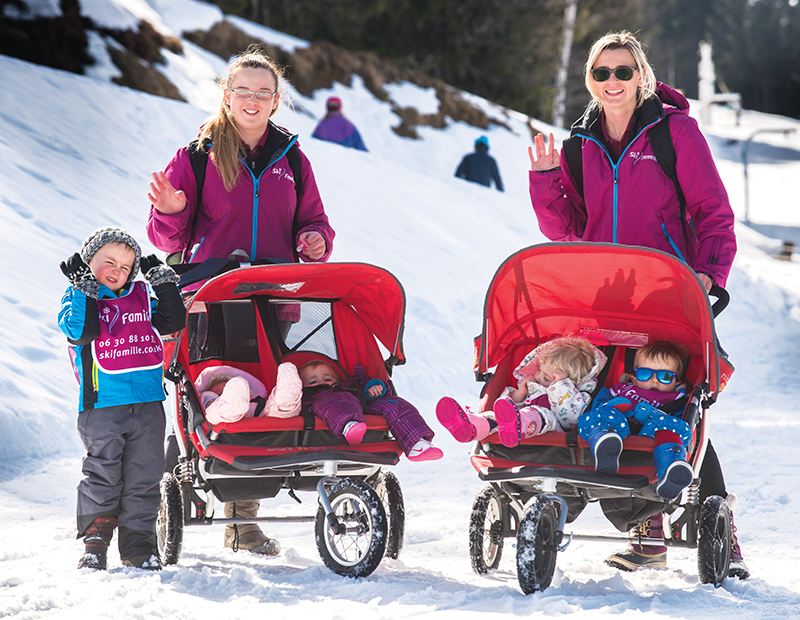 Our passionate and enthusiastic childcare team will walk your children to and from the ski school meeting point each morning. There is a fair amount of nightlife around Plagne Centre, which is why we prefer the quieter satellite resorts of Plagne 1800 for our family holidays. Adults can always hop a shuttle bus if they want to step out for live music in Plagne Centre, and more action-packed night-time fun, but Plagne 1800 does have some excellent restaurant choices – like Le Petite Chaperon Rouge and Le Cantine. There are some thrilling non-skiing activities too, like the bobsleigh track for any brave adults (yes, they’ll let you try it! ), tobogganing, dog-sledding, snowmobiling, paragliding, and more. If you like your fun a little less daring, there is a new ice skating rink, bowling, a cinema, a sports centre and, not far away, the Deep Nature Spa and Swimming Pool. There is also a weekly market on Thursdays, and shopping facilities nearby. There are two reasons La Plagne didn’t quite top the list, and the first is the make-up of the ski runs. If your family is made up of intermediate skiers, then this might be the ideal place for you to go, but most families aren’t. Most families have a range and, in many cases, that range is primarily toward the Green end of skill and experience. This isn’t a bad place for novice skiers, but it is not specifically geared toward them. The second reason is that the off-piste amenities of our top choice resort are just a cut above. The skiing is excellent, as you’ll read below, the other factors are in place – but the family fun-factor is top-notch, and spreads well beyond the slopes themselves. We’ve given the top spot to Les Bruyeres, our pretty resort in the same valley as Reberty 2000 and Val Thorens. The three are close together, have many of the same amenities, and share the same massive skiing network of Les Trois Vallées (3 Valleys). 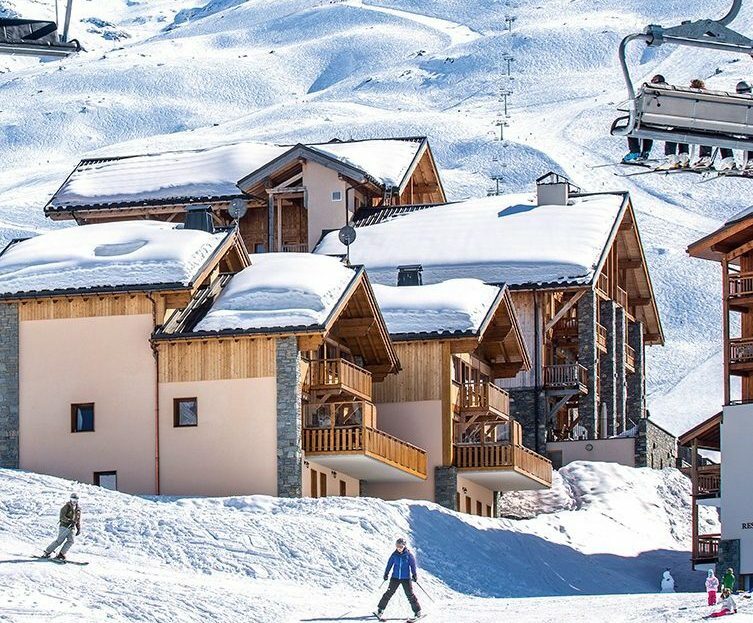 Each has its own doorstep benefits too, so we will include a brief word on Reberty and Val Thorens – but top prize goes to Les Bruyeres itself. Les Bruyeres resort is in the French Alps, just inside the Réserve Naturelle du Plan de Tueda (Natural Reserve of the Tueda Plan), two and a half hours on our exclusive transfer from Geneva airport. Les Bruyeres is a family favourite at all points of the skiing season, and Easter is no exception. Bruyeres offers some of our finest new chalets in our Premier Select Plus category, and perhaps the best part is their proximity to the slopes: from Chalet Aigle and Faucon you can pop into your skis just outside your door when you begin your day, and slide right up to it again in the evening. No walking, just ski-in, ski-out convenience. Our other two chalets in Les Bruyeres (Aigrette and Corbeau) are not quite ski-in-ski-out although if you dig your ski poles into the snow and push yourself along a flatter track, you can just about ski to your door! 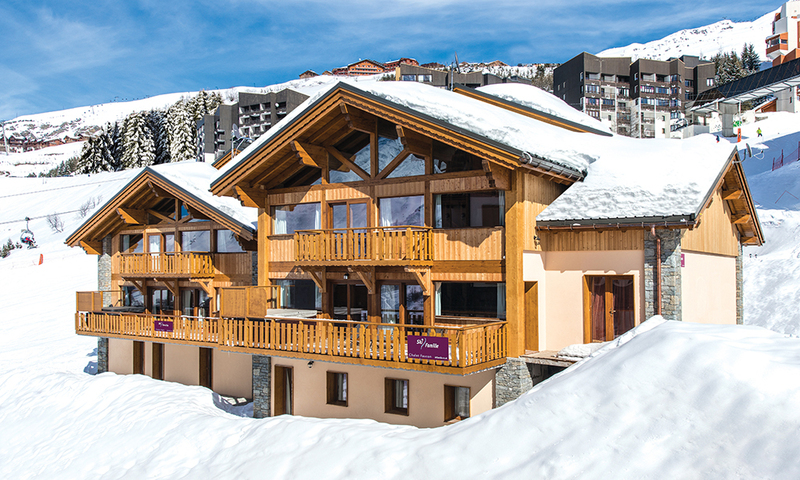 Our Les Bruyeres chalets are built to our own specification in superb piste-side locations. Each chalet offers spacious family suites, their own private cinema, hot tub and stunning interiors. All also offer espresso coffee machines, an upgraded wine list and cheese board. Bruyeres is known for great snow. It’s not a very northern resort, but it has the high altitude (1850m) and microclimate necessary to give you the best chances of great conditions even as late in the season as Easter. There are no guarantees when it comes to nature, but the location of the 3 Valleys area means that reliable snow conditions are available throughout April, with lifts and runs operating into the first week of May. About 13% of the slopes in Les Bruyeres are Green (beginner/easy) runs, and 10% as Black (expert/difficult) runs; the other 77% is more or less evenly distributed between Blue and Red. This means a heavy majority of the area is best for intermediate skiers: from daring beginners to those flirting with the deep and steep. The lower percentage for beginners doesn’t mean an outright lack of variety though. The area is large and is part of the 3 Valleys network, so if you feel they’ve seen enough of the slopes right next to your chalet, you can range further in full confidence of finding new – but still suitable – runs to explore. There are even two dedicated beginners’ areas, with ‘moving carpets’ to help the brand new skier gain confidence and basic skills. We use Ecole du Ski (ESF) Ski School in Les Bruyeres. There is a wide variety of ski schools available in the area, offering both group and individual lessons. If you want to learn as a family, private group lessons can also be arranged. Whatever your level, from first-timer to an experienced expert who wants to hone difficult skills, there are skilled instructors on hand to help. Lessons are commonly available in English and/or French, (and other languages depending on the availability of instructors). One of the best features of this resort is the Aquafun and Wellness Center, three and a half thousand square metres of splashing fun. There is an Aqua-Fun pool with underwater seating, waves, and massage jets, a children’s area with an ‘ice’ theme, and a wellness centre for adults, offering Jacuzzi and sauna facilities. Best of all, it’s close enough to some chalets to visit every day. Or for those who don’t want to venture out of their chalet, Massage Me offer a mobile massage service to get your muscles back into shape without even leaving the comfort of your room (15% discount for Ski Famille guests too). There are excellent restaurants nearby too. Les Marmottes restaurant and bar has good food, plenty to drink, and a traditional Savoyard (local alpine culture) atmosphere. You can also hop the shuttle and check out La Potiniere, L’Igloo, or L’Antigel – each with its own charms and specialities. Your family can try dog-sledding too, catch a film at the cinema, do a little snow-mountain-biking, tobogganing, drove a snowmobile, and more. There is no lack of fun opportunities at Bruyeres. Reberty 2000 and Val Thorens are located just up the valley from Les Bruyeres, so many of the reasons Bruyeres is a good choice are also applicable to them. 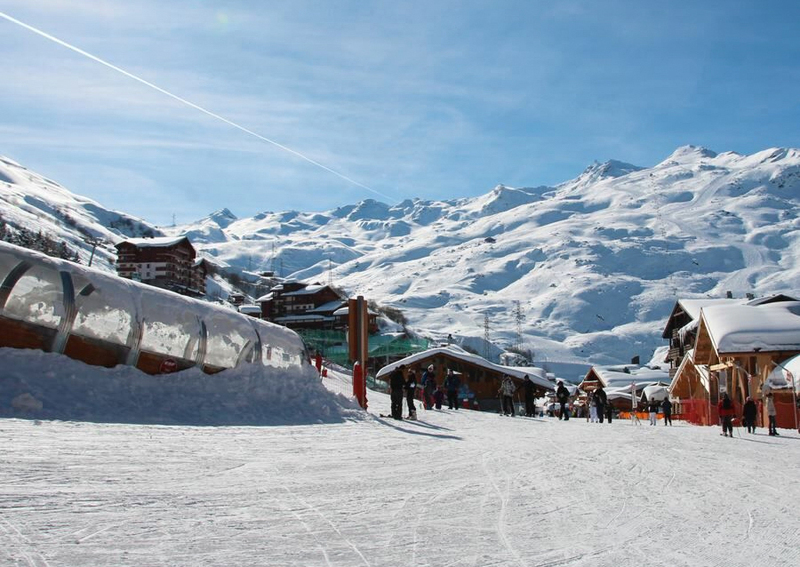 At 2000 metres, Reberty is a little higher, and Val Thorens at 2300 metres is the highest of the three, but each of these resorts has access to the same 3 Valleys network of runs. Two advantages of Reberty is that it has a ski hire shop (Ski Set) we use practically on your chalet’s doorstep, and a supermarket very near your chalet too in case you want to stock up on extra snacks and treats. Les Bruyeres and Reberty 2000 are not far apart, so whichever one you choose, the public amenities of the others aren’t far away. Choose the one with the chalets you most like, or with the most-desired features on your doorstep, or room configurations that work best for your family, and then enjoy the area as a whole. Please be aware though, our chalets are very popular and do get booked fast, so we advise you to consider planning your holiday early for a greater selection and choice. The combination of excellent chalet choices, a wide variety of runs for all levels, great off-piste activities, and reliable snow conditions says it all. Everything you want in a ski holiday is at Les Bruyeres, despite the late-season timetable, and then there is the added bonus of milder weather to top it all off. It truly is a top-notch choice for your Easter family holiday. Any of these resorts can deliver a great experience for you and your family – both on and off the slopes – so don’t hesitate to talk them over with our friendly and knowledgable team on 01252 365 495.